The Oregon baseball team has been on a slide as of late. Pitching struggles and an inability to score runs consistently have resulted in losing four straight games before getting a win last Sunday at Cal. With 14 games in the next 19 days, it’s a perfect time for the diamond Ducks to turn it around. Head Coach George Horton spoke to Josh Graham during the San Francisco series. The losing streak began March 10-11 with home games against San Francisco. In those two games, Oregon was outscored 12-3. Coming into the season, consistent pitching was going to be a concern for the Ducks, and those concerns have now begun to show themselves. 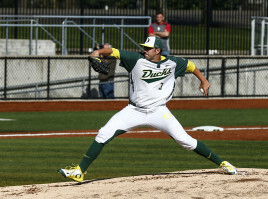 In the two losses to the Dons, Oregon starters went only 6.1 innings combined in the two games. Quick exits by the starters put a tremendous amount of pressure on the bullpen, and the Ducks weren’t able to rise to the challenge, allowing 9 runs in their 11.2 innings of work. The struggles continued in the first two games of a three game series at California. To begin the series, the Ducks lost 9-3 and 6-2 before ending the four-game skid with a 4-2 win. Once again, pitching seemed to be a struggle as starters went only 8.2 innings and allowed nine runs in two games; however, out of the nine runs, only four runs were earned. If the pitchers were in trouble, the defense certainly didn’t help them out. The four-game losing streak resulted in an expected slide in the six national polls. But enough about the losses – how can Oregon turn this around? Freshman pitcher David Peterson has posted a 3.00 ERA and 31 strikeouts this season. The Sun Devils have won two series in a row against the Ducks, but the last time these teams met in Eugene the Ducks swept the three-game series. 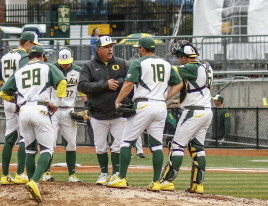 If Oregon is to sweep once again, the starting pitchers will have to be much more consistent. Junior reliever, Conor Harber, will get his first start of the year in Friday’s series opener before handing the reigns over to freshman David Peterson and sophomore Cole Irvin. 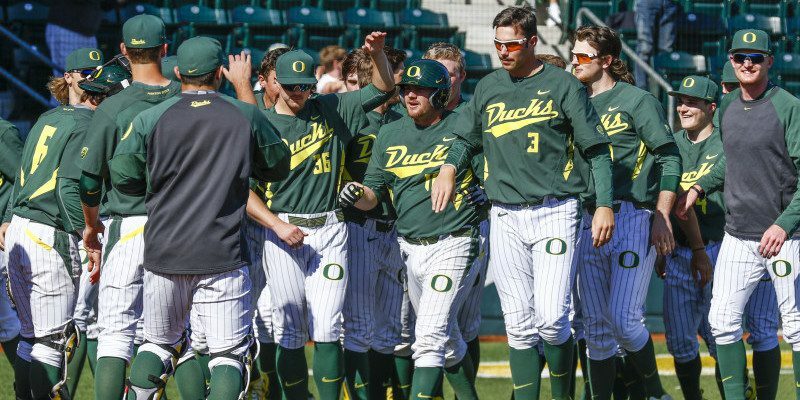 The three probable starters have allowed only 29 runs in 72.2 innings so far this season, numbers that may help Oregon get a much needed series win. These next three games against Arizona State are pivotal if Oregon wants to hit the 40-win mark — an unofficial benchmark for post-season play — for the fourth consecutive season. Sure there are more games after this series, but this 3-game set is the start of a key chunk of games that the Ducks must win the majority. With a magic number set at 40 wins, Oregon must win 26 out of the 40 remaining games to achieve that number. The upcoming stretch of 14 games will challenge the depth and consistency of Oregon, but if the diamond Ducks can win, say, 10 of 14 during the stretch, they will be in great shape to get those 40 wins and get back to the post season for the fourth straight year.